Tiger Muay Thai and MMA Phuket is the only MMA gym in Phuket Thailand that is able to attract International fights with good exposure for MMA fighters looking to further their professional careers. Long Time TMT representative Muhsin Corbbrey will be returning to Phuket Thailand in April as he prepares for another televised bout. 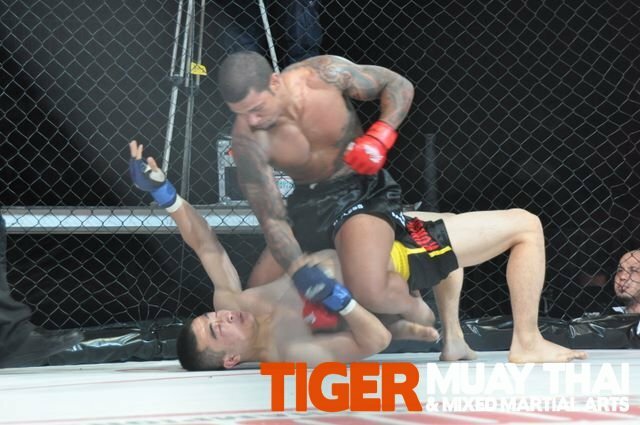 Fighting for Tiger Muay Thai and MMA Phuket 3 times during an 8 weeks trip earlier this year, Muhsin went undefeated winning two Muay Thai fights in Phuket, and defeated Chinese MMA fighter Wu Cheng Jie for the Martial Combat- ESPN STAR Sports promotion. Corbbrey’s impressive performance in Martial Combat was shown on TV in 24 countries to a broadcast of over 310 million homes. Looking to build upon his recent success WEC and Elite XC veteran Muhsin Corbbrey will be using Tiger Muay Thai and MMA Phuket as his training camp as he prepares for a June showdown against Adrian Pang for the CFC organization in Australia. Adrian Pang is regarded as the #2 Lightweight MMA fighter currently living and training in Australia, and the bout will be showcased on the Fox Sports Network in Australia. The winner of this highly anticipated bout will more then likely move on to face Bernardo Trekko (10-1) for the CFC LW Championship belt.